Physical Security at High Value/High Risk Facilities - Eric Linden, Managing Director, Integritas Security Service Inc. Integritas provides canines for facility security including bomb and drug dogs. Eric Linden will explain and demonstrate the use of dogs including a field demonstration. Facility audits – The Good, The Bad & The Ugly - Lessons Learned From Facility Audits & Plan Development – CAPT Brian Kelley, USCG, (ret. ), Chief Operating Officer, Seebald & Associates – Over the last several years Seebald and Associates have conducted a large number of audits, assessments and the development of plans. During this session, Brian and the Seebald team will share some observations, “lessons learned” and a blooper or two. Thank you and hope to see you in New Orleans. Active Shooter – Federal Bureau of Investigation Special Agent Natalie Phelan, New Orleans FBI Office – As the active shooter situations becomes increasingly more common, Special Agent Phelan will discuss what signs to look for to prevent potential situations, how to protect yourself and respond. She will also answer questions. Panel Discussion - Cyber-Security Threats in the Maritime Environment - Panel - Coast Guard Cyber Command Representative; Cliff Neve, Managing Partner for MAD Security and FBI New Orleans Special Agent. Recent reports indicate the potential for tragic consequences if our port facility technology systems are “hacked”. The reports also indicate that many US ports are currently at high risk. A panel of government and industry experts will address this important topic. The FBI’s Role in Managing Security in the Maritime Environment - Supervisory Special Agent Clinton J. Morano – serves as the Unit Chief for the Federal Bureau of Investigation, National Joint Terrorism Task Force - 2 – In this session Supervisory Special Agent Morano will provide insight into the FBI’s role in counterterrorism and its maritime security association. His supervisory responsibility for 900+ FBI agents and Task Force Officers assigned to FBI offices throughout the country will provide great insight into current threats and risks. Natural Disaster Response and Security – Rear Admiral Thomas Atkin, Coast Guard (ret.) and Commander John Lovejoy, Marine Safety Office Port Arthur Executive Officer – During this session, they will discuss Hurricane Katrina’s and Harvey’s impacts, the Coast Guard’s response and how security was managed. Captain of the Port Panel – Facility Security from COTPs view: CAPT Kevin Oditt, Sector Commander Houston-Galveston and CAPT Kristi Luttrell, Deputy Sector Commander New Orleans. This panel discussion will present the local Captain of the Port’s perspective on Facility Security inspections, issues, and policy challenges affecting MTSA regulated facilities in their area of responsibility. Coast Guard Policy Changes and Regulatory Requirements: Transportation Worker Identification Credential enforcement and Facility Security Plan Cyber Security requirements – Lieutenant Commander, Yamaris Barril, Office of Port and Facility Compliance, USCG – In this session, LCDR Barril will share the latest policy and regulatory changes regarding Transportation Workers Identification Credential (TWIC) final rule enforcement and the Cyber Security NVIC that will affect Facility Security Officers and regulated facilities in the near future. LCDR Barril will also discuss facility inspection violations from all MTSA regulated facilities over the past two years and respond to questions related to current policy and regulatory issues. An FSO's work is never done! 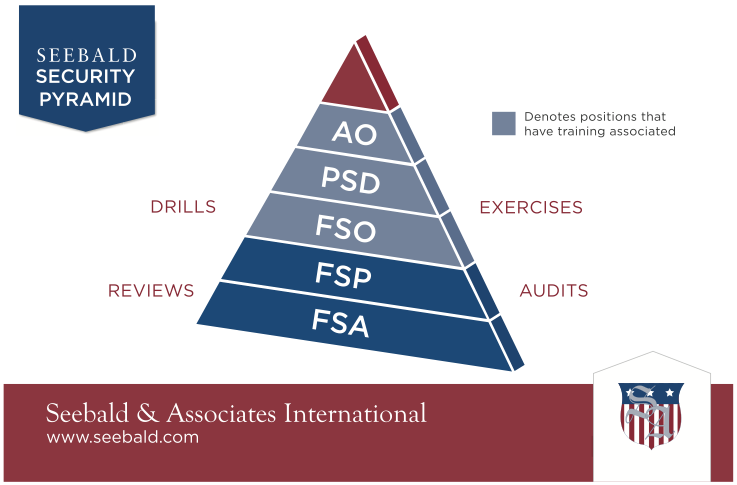 This month’s Blog series has covered FSO Duties. We’ve provided a good overview of 33 CFR 105 requirements, but that’s not all you must know and do. We trust you remember 49 CFR 1520, which is where it gets personal for the FSO as you can be held personally liable for any infractions. Now that we have your attention – Sensitive Security Information. Marking your security documents appropriately, ensuring only those with a need to know can access them, and securing them in an appropriately locked up when not in use is the FSO’s duty. Additionally, if we have performed an FSP Audit for you, you should have noticed the criminal provisions associated with the laws and regulations governing maritime security. This should reinforce to you and your company’s senior leadership that the FSO duties are significant and important to not only the company but to the United States of America. Question – throughout this Blog series, did getting out of your office to conduct a FSO Review come to mind? It’s your job to conduct these…frequently, and remember to document them. If you are literally or figuratively scratching your head right now or better yet trying to remember where your FSO Course notebook is to do some research, that is a clear sign that you need to sign up for either the full S&A FSO Course or S&A FSO Refresher Course today! Stay Secure – Americans Everywhere Are Counting On You!